A homeless woman who slept in Tallaght Garda Station in Dublin with six of her children last Wednesday has been told by Dublin City Council that a three-bedroom apartment has been found for her. Margaret Cash said the apartment is being made available for a week's trial and after the trial it will be on a monthly basis. Dublin Region Homeless Executive said the one week trial is the policy of the letting agent for the property in which the apartment is located. The apartment is temporary emergency accommodation, which is why it is to be provided on a month-by-month basis following the week trial. Last week Ms Cash and six of her seven children, aged from one to 11, slept in the garda station after they could not find emergency accommodation. Gardaí at Tallaght said the family presented themselves at the station as they had nowhere else to go. The family was cared for at the station and left in the morning. Ms Cash posted several images of her children sleeping on chairs at the station on social media. The baby slept in a buggy. Speaking on RTÉ's Today with Miriam, Ms Cash said she ended up homeless because the private rented house she and her family had been living in for three years was repossessed and she could not afford anywhere else. She said she and her children have been staying in temporary accommodation for the past year and while those places are usually "nice and clean" they have to leave by 9am and may have to wait until later that night until accommodation can be found again. Ms Cash said she was married at 15 and spent most of her life living in caravans, but as her children got older she opted for private rented accommodation. Responding to criticism of her on social media and elsewhere following the publication of the photos from Tallaght Garda Station, she said: "I've never told anyone that I was poor, I only ever said I was homeless". She said she has enough [money] to get her through the week, but not enough to get a home. 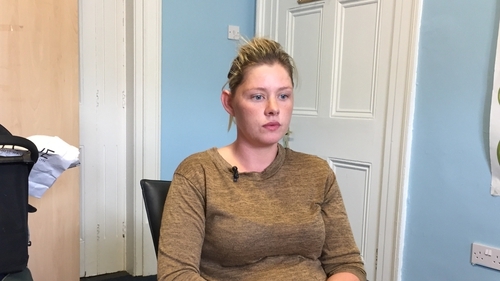 When asked about why she refused an offer of accommodation from the DRHE on the night she and her children slept in the garda station, she said the accommodation was one room in Co Meath and she was told only five of the children could go there. Ms Cash said her children are what keep her going, but expressed anger at politicians, who she said despite their reaction to her story have not contacted her. "They don't care about me, they don't care about the next homeless person ... they know their families are well sorted". She said she is frustrated at the fact that "they think this is okay ... we are Irish citizens, born and reared in this country ... every child is entitled to a home". She said her children will be "over the moon" that an apartment has been secured for them.